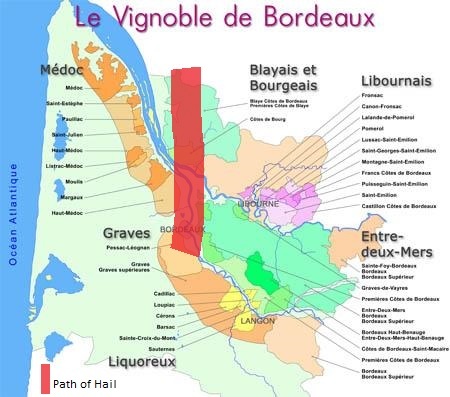 Hail fell across localised parts of Bordeaux and Cognac on Saturday 26th May over a 15 minute spell causing major damage to hundreds of vineyards with thousands of hectares of vines destroyed. The storm first hit south of the region with heavy fall in the city. It then moved up across parts of Haut Medoc, across the Gironde and onto the right bank affecting Bourg and Blaye. Initial concerns were that the hail would be as severe as the frost of 2017. More serious damaged has however been reported in Cognac with around 10,000 hectares affected. President of the General Union of Cognac Winemakers, Christophe Veral reported it as a “catastrophe” in a conversation with The Times.